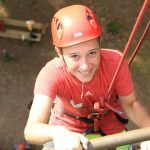 North Star’s three climbing walls provide campers the perfect setting to learn and develop the skills to become top notch climbers. Our main 60 foot climbing tower has three faces, two obstacle faces and one rock face. Beginning campers will start on the obstacle face, learning the basics of climbing while also achieving success using the obstacle implements. 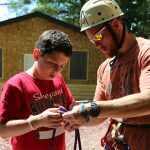 Campers are taught climbing safety procedures, knot-tying skills, and how to care for the equipment. As climbers progress, they use the rock face, which has a wide variety of routes for the wide variety of skill levels of our campers. 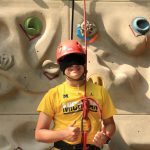 North Star also has a smaller 40-foot “challenge wall” which is used for more competitive climbing, as well as a bouldering wall, which allows campers to work one-on-one with our experienced climbing instructors and has a 15-degree overhang on one side.